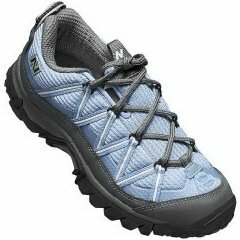 CLICK HERE to order Tecnica Gore-Tex Spirit Low Hikers. For a hike in the woods… or an all-day adventure, slip your feet into these low hikers. Lightweight and supportive, they have a water-resistant nubuck/mesh upper with a breathable Gore-Tex Cambrelle lining system. Injection-molded fastpack outsole creates a leakproof bond with the upper; offers exceptional flexibility and traction. Speed lace closure. 2 lb/pr.